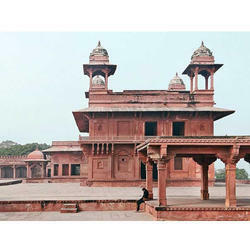 Providing you the best range of red fort holiday package, fatehpur sikri holiday package, jama masjid holiday package, temple of hathee singh holiday package, calico textile museum holiday package and delhi tours services with effective & timely delivery. In the south of the city, stands the Qutab Minar, a magnificent tower at the foot of which was built a mosque with 27 pillars taken from the Hindu temples. Farther, the wide avenues lined with trees and flowers take you across the colonial city up to Rajpath, the artery leading to the Presidential Palace built in red stone. Then the Parliament, India Gate, the astonishing modern temple of Lakshmi Narayana, and finally Connaught Place, a lively and animated center of the new city. 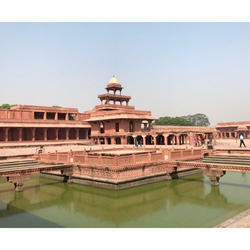 Entirely built by Akbar, it was the capital of the Mogul empire but only for a period of 14 years. Also known as the ghost city but very intact, it is surrounded by walls of red sandstone covering a distance of 11 km and it dominates the surrounding plain. A succession of courtyards, apartments, pavilions and basins, temples and mosques reveal the secret of the most luxurious court of the East in the 17thcentury. This mosque was built in 1423 by Ahmed Shah. Combining the Hindu and Muslim styles, it has 260 pillars supporting three rows of five domes. One enters the mosque by a large arch decorated with friezes. Inside the faithful find themselves on a large paved with 75 yards on 66 whose center courtyard is a basin. Near the entrance is located the tombs of Ahmed Shah, his son and his grandson. It is a Jain temple built in 1848 and dedicate to the 15th Jain tirthankara. 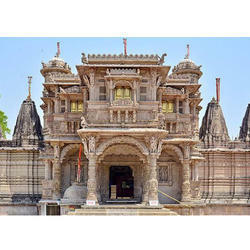 Like the majority of Jain Temples, this temple is richly decorated with magnificent sculptures. 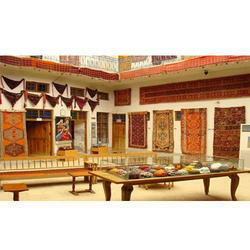 Opened in 1949 it houses a beautiful collection of textiles from all over India. Part of the museum is devoted to textiles used for religious ceremonies, while the other section has costumes, carpets, draperies and tapestries of historical origin. The museum showcases the different weaving techniques used across India today and also of generations past. 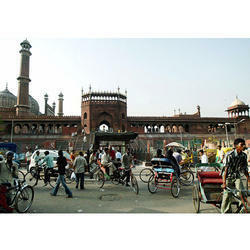 We have marked a distinct place in the industry by providing a high-quality array of Delhi Tours Services. 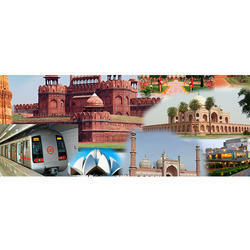 Our professionals interact with customers and understand their requirements to perform the Delhi tour service. Offered tour services are available as per the patrons need. 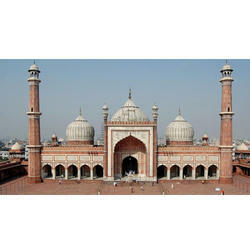 Additionally, customers can avail this Delhi tour service from us at the most affordable prices. We are engaged in offering an optimum quality array of India Tours Services for our esteemed customers. These services are rendered using top grade resources as per set industry values. In addition to this, these are offered at affordable prices to attain high customer satisfaction. We are engaged in offering Tour Services for our esteemed customers. The provided tour service is performed as per the variegated requirements of our patrons. These are rendered using the latest technology. Apart from this, we are offering this tour service range at the budget-friendly market price. 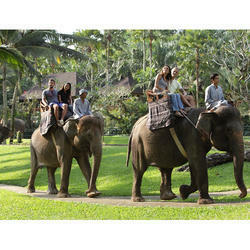 Through regular improvement, we are offering an exclusive collection of Holidays Tour Services. This tour service is performed within the scheduled time-frame. This service is much-admired by our clients for its perfect package and promptness. Offered array of services is rendered using best grade inputs. 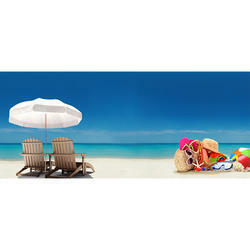 With precise knowledge of the relevant field, we are instrumental in offering a comprehensive range of Holiday Packages. We offer packages as per the clients need. Also, offered services are much admired due to executed as per the norms, highly flexible, pocket-friendly prices, and quality assured. Assisted by our talented professionals, we are offering an exceptional assortment of Elephant Safari Tour Packages to our customers. 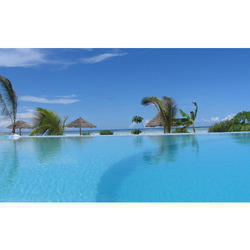 Our team members make sure that the tour packages offered by us are in accordance with the quality standards and norms. Also, offered tour packages are admired for their reasonable prices, perfect execution, and client-centric approach.